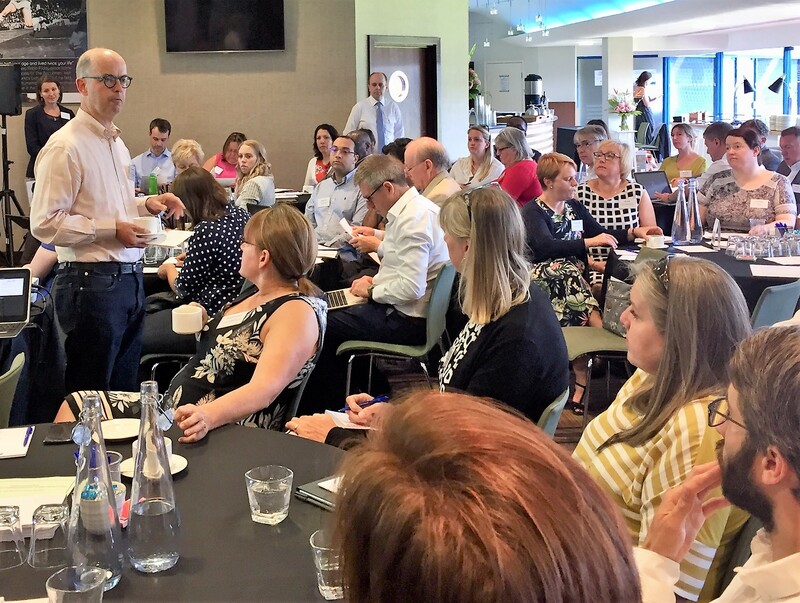 Guy Boersma, Managing Director, Kent Surrey Sussex Academic Health Science Network, welcomed more than 100 delegates involved in outpatients transformation to the Royal Berkshire Conference Centre in Reading on 22 June. 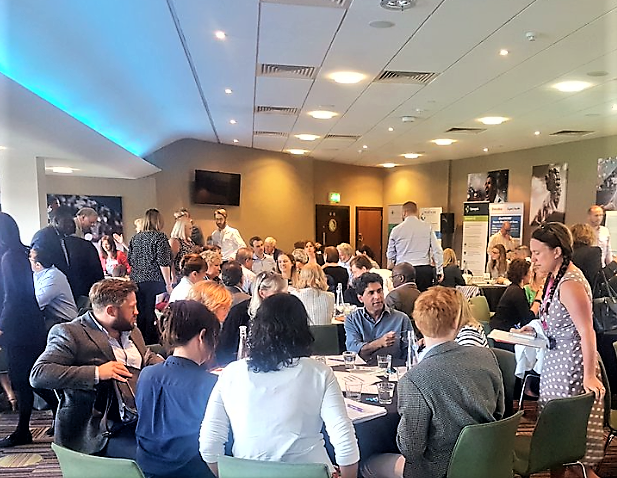 The audience included more than 75 NHS staff covering 28 NHS trusts across the south of England , and representatives from NHS England, commissioning support, primary care, the academic health science networks and 10 industry partners. Guy opened the event with an entertaining quiz, where he tested the audience’s knowledge of NHS budgets and national outpatient activity statistics. Cathy Francis, Regional Director of Patients and Information, presented on behalf of NHS England and NHS Improvement (South). She described the shift in power to the consumer in the digital world and the growing appetite and expectation of the public for digitisation of healthcare in line with other areas of their lives. After providing a snapshot of outpatient activity data in the South of England, Cathy spoke about her family’s personal experience of outpatients and the disruption and inconvenience it can cause. The first case study presented was on the work of Dr Azhar Ansari, Consultant Gastroenterologist at Surrey and Sussex Healthcare Trust. His team’s patient-centred approach supports patients with irritable bowel syndrome through early intervention, prevention and patient activation, resulting in better care and outcomes. Service user, Jeremy Hyde, spoke about his poor experience in outpatient services and contrasted this with the service he now receives, supported by Dr Ansari’s team and the digital platform Patient Knows Best. Dr Adrian Byrne, Chief Information Officer at University Hospital Southampton NHS Foundation Trust, gave an overview of My Medical Record, which includes an open personal health record and interfaces with other front-end applications. The platform is in use across a number of services across the trust, including prostate cancer. Dr Byrne’s team uses workshops to support, patients to monitor their conditions and self-manage their care. Outcomes include a 20% reduction in outpatients appointments. The trust, a global digital exemplar, plans to roll out the scheme further in the near future. Darren Woodall, of South Devon and Torbay NHS Foundation Trust, spoke of the trust’s vision to create value-based networks in all areas of healthcare delivery, underpinned by IOCOM’s Visimeet technology. Based in a remote and rural setting, this technology supports in peer-to-peer, clinician-to-clinician and patient-to-clinician communications and offers a useful education portal. Following the case study presentations, industry partners responded well under pressure by delivering two-minute briefs on their products and services. Companies included Cievert, DrDoctor, Physitrack, Cerner, Health and Care Videos, Docobo, Healthcare Communications Ltd and Synopsis. Delegates worked in groups to discuss themes in outpatients, including referrals, appointments, wayfinding, information gathering and dissemination, remote consultation and portals. We will share the insights gained with trusts in the coming weeks. After the workshop session Guy summed up the key points of the day, polled delegates on the next steps and discussed “how to capitalise on the raised awareness and the broad ambitions” of the trusts. He thanked the audience for attending and brought the event to a close.